PHILADELPHIA (WPVI) -- A lot of Action News viewers are having a snow day Thursday! 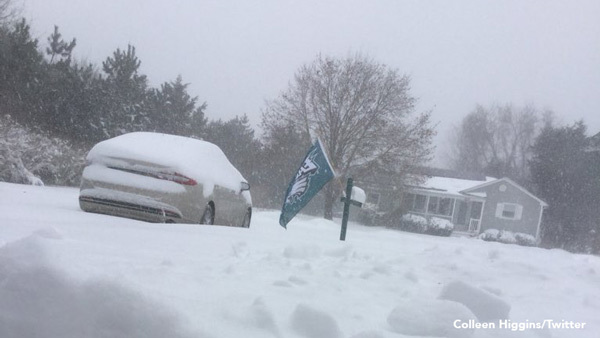 They sent in photos and videos on social media using #6abcAction. Andrew Rowan recorded a time-lapse video of the snow falling in Cherry Hill, New Jersey. Barb Demusz took video of her 6-month old dog Bear playing in the snow in Point Pleasant, Pennsylvania. And it wasn't just dogs having fun with the snow. Wendy Saddler's cat Princess Isabella checked out the storm, but from the comforts of inside their Bensalem, Bucks County home. Bella showed the windy wintry conditions in Atlantic City. Snow covered the cars in this viewer's video from Egg Harbor City. David Reed captured the snow falling while on the SEPTA Regional Rail. The Wildwood Police Department sent in photos of what the Boardwalk looked like at 9:30 a.m.
For one young boy, however, he was happy with the stormy weather in Runnemede, New Jersey. Happy enough to sing! You can send in your videos and photos to Action News using #6abcAction on social media or uploading them to Jointheaction.6abc.com/.